Well I do love Crafterscompanion products. And I so had to make these cards after seeing Debbie Clough's blog. 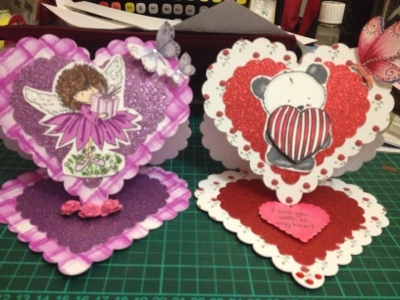 I made the scalloped easel cards using the sizzix scalloped heart dies. The Angelica one (fairy) I used the purple backing paper, glittered purple coordinations card stock, and I stamped Florence on to Neenah card stock and coloured her in using my spectrum noir pens. I added 3 flowers and the two butterflies came in the bamboo blockbuster paper kit. Bamboo I coloured in using my spectrum noir pens and I cut 2 hearts to make it into a decoupage. The sentiment is also stamped and I used DR1 to colour the heart and stamped the sentiment on. I added red gems and also the butterfly as the finishing touch. Two gorgeous cards Sam, love the images and the beautiful embellishments. Both cards are lovely with you.